Published: Jan. 27, 2013 at 01:56 p.m. The NFL Network research team provided NFL.com with hundreds of tidbits for the 2013 Pro Bowl. Check out the ones that will blow your mind. This is the 33rd Pro Bowl to be played in Hawaii. 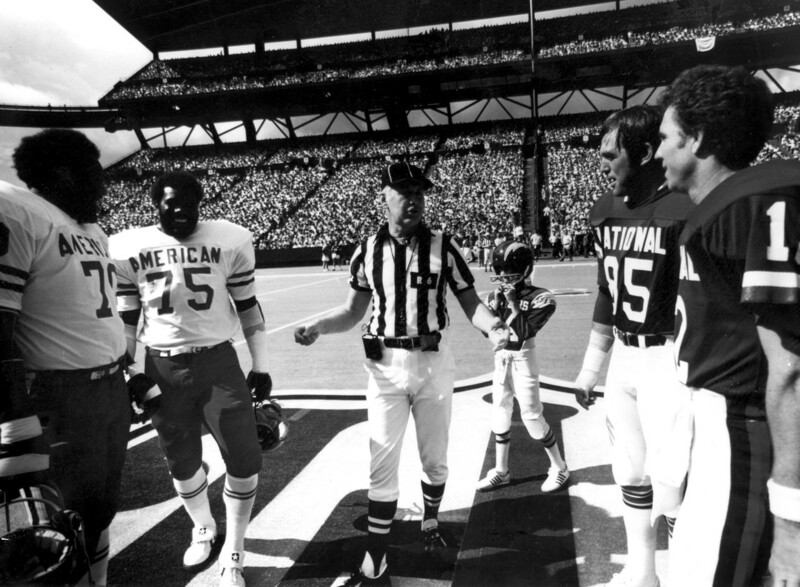 The first Pro Bowl in Hawaii was the 1980 Pro Bowl. Every Pro Bowl from 1980 through 2013 has been played in Hawaii except the 2010 Pro Bowl, which was played in Miami. Super Bowl XLIV was also held in Miami that season. Three rookie quarterbacks were selected to the 2013 Pro Bowl, the most all time. Robert Griffin III, Andrew Luck and Russell Wilson are the 2012 rookies selected to the Pro Bowl. In Pro Bowl history, nine rookie quarterbacks have been selected, including five to the 2012 and 2013 Pro Bowls. San Francisco 49ers kicker Davis Akers tied the NFL record for the longest field goal made, converting a 63-yarder in Week 1 against the Green Bay Packers. Akers also has the longest field goal made in Pro Bowl history, making a 53-yard field goal at the 2003 Pro Bowl. Two rookies have been named Pro Bowl MVP (called Player of the Game from 1973-2007), Indianapolis Colts running back Marshall Faulk at the 1995 Pro Bowl and Minnesota Vikings running back Adrian Peterson at the 2008 Pro Bowl. Faulk rushed for a Pro Bowl-record 180 yards as a rookie, averaging 13.9 yards per rush, also a Pro Bowl record. Peterson rushed for 120 yards at the 2008 Pro Bowl, the second-most in Pro Bowl history. Wide receiver Brandon Marshall set the Pro Bowl single-game touchdown record at the 2012 Pro Bowl with his four receiving touchdowns. San Francisco 49ers head coach (then Indianapolis Colts QB) Jim Harbaugh threw three interceptions in the 1996 Pro Bowl, the only Pro Bowl that Harbaugh made in his NFL playing career. Harbaugh had passes intercepted by safety Darren Woodson, safety Tim McDonald and linebacker Ken Harvey -- who returned his interception 38 yards for a touchdown. Remarkably though, three interceptions is not the most thrown in a single Pro Bowl -- that honor belongs to St. Louis Cardinals quarterback Jim Hart, who threw five interceptions in the 1977 Pro Bowl, which was played in Seattle, Wash. The Houston Texans have the most players selected to the 2013 Pro Bowl with nine. The most players selected from a team in a single season since the merger was the 2007 Dallas Cowboys, who had 13 players selected. This is Peyton Manning's 12th Pro Bowl selection, the most all time by a quarterback. Tight end Tony Gonzalez was selected to his 13th Pro Bowl this season, which is five more than any other tight end in Pro Bowl history. Cornerback Champ Bailey was selected to his 12th Pro Bowl this season, the most all time for a cornerback. Bailey has played in all 11 of the Pro Bowls he has been selected to. He will be playing in his 12, tying him with offensive linemen Randall McDaniel and Will Shields on the list for the most Pro Bowl games played in NFL history. The 2-14 Kansas City Chiefs had six players selected to the 2013 Pro Bowl. They tied the 2010 Carolina Panthers (2-14) and the 2001 Panthers (1-15) for the most players selected to the Pro Bowl for a team with two or fewer wins in a season.